Running and walking are two athletic words in common that is super beneficial to health. This piece emphasizes my personal experience of running or even ultra running. It might also come as a handy reference to those who want to take running like a fashion. Thinking to run is somewhat unusual because of our mind’s perception of it; we usually think of running as to get tired. Yes, whatever we do, there’s always an equal result whether we will feel an exhaustion or rather an enjoyment of the exhaustion. In this sense, you should have the acceptance of whatever experience your passion will give you. There’s a quote, ” Take your passion and make it happen,” which for me simply means the realization of your interests. 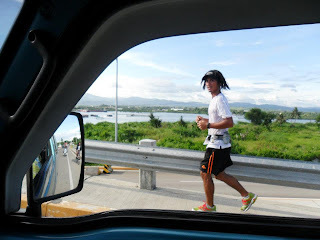 In my case, I easily adapt to running due to our lifestyle, as a kid in a secluded area from Bunacan, San Isidro, Leyte to full grown teenager exposed to work in mobility. But being itinerant is not the main prerequisite reason to running. The only requirement to run is Yourself. Being naturally agile may help us easily adjust to running, but it is not what can keep us from sustaining it. I’m calling it as my “DPD principle.“ Dedication is offering our self onto the interest for running. Patience is to have the patience to go through whatever activity interconnected or in preparation to running. You are determined and firmed to cross or finished the line may it a practice or a challenge. Applying this principle will surely change the way you accept running. It really works in my journey called running. As an active participant or being a regular runner, it certainly enhances alertness and physical effectiveness. And, it is a given that it has a big impact on our health. Health at this critical time is essential. Being fit is necessary to face everyday challenge. And, I can count on the preparation for the journey of pursuing long-distance running to contribute in easing our health. Most people start running because they want to control their body weight. You start loosing weight when you burn more calories than you assimilate, thus making your body turn to the fat it has stored in order to compensate the energy deficit. Running is considered to be one of the most effective exercises when it comes to burning calories. In fact, a typical runner who takes running seriously can burn up to 500 calories in less than an hour. There is a very strong connection between the development of our muscles, bones and effort. Muscles and bones will grow depending on the efforts required of them. By sitting at your desk all day, your bones and muscles will get weaker in time. A very good solving solution for this problem is running, because this exercise is highly demanding on your bones and muscles. Running will trigger bones to become more dense and will also help build muscle tone. In response to running on a regular basis, your heart will be more healthy and your blood pressure will lower. Running also lowers your cholesterol level and reduces the risk of blood clots and heart attacks. It’s a proven fact that running lowers stress level. Speed running can also release anger and frustrations and can calm you down. Running long distances can help you find solutions to your problems or, even better, can make you forget about them for awhile and clear your mind for a few moments. After a running session you’ll feel better, be more optimist and have a better morale in general. People who exercise by running have shown to be more confident in their own strengths. After constantly surpassing the limits of your own body, you will get stronger with every run and your self-esteem will build up. Results like loosing weight, stronger muscles or better health in general, after maintaining a rigorous running exercise program, will also make you feel better about yourself. As mentioned above, regular running exercises will make your bone and muscle structure stronger. Those who live a sedentary life will have a weaker skeleton and muscle loss, thus making them more susceptible to various diseases. Having strong bones and muscles becomes more important as you age and both will leave a mark on your looks. Running is not easy. It can be a very painful experience, especially for newcomers and that is why most people drop it after a few runs and fall to their old habits. By surpassing that pain and the temptation to just stay comfortably in your house and postponing the running session for tomorrow, you earn the determination and willpower to succeed in other areas of your life. Running increases the number of lymphocytes, also known as white blood cells which are essential to your immune system. It also reduces the risk of diseases like breast cancer, osteoporosis and diabetes. Surprisingly enough, coordination does improve with running. Some people may be reluctant to acknowledge it, since it’s such a simple sport, but running involves coordination especially on hard terrain with small obstacles like rocks and tree roots. Experienced runners who use trails as their rout, learn how to avoid stumbling and tripping on such obstacles. How much and how well we sleep has a lot to say for our health. After an intense exercise like running, your body needs to recover and repair itself. It is vital that you don’t overexert yourself as this will cause a lot of damage to your body. By keeping this in mind and exercising regularly you will feel more relaxed and you will sleep more soundly and profoundly. Runners usually fall asleep quicker and stay in a deep state of sleep longer than people who aren’t very active. Hopefully these 10 reasons will be enough for you to get your eyes of the computer, put on a pair of sneakers and go out for a quick run. Go for it! Yes, these 10 reasons speak a lot the for the contribution of running to health. We have talk much about running’s contribution to health, how about your running gear? Running gear is really not a problem. What you just need is wear your comfortable singlet, short, socks and shoes. As long that it will not bother the way how you run, your gear is not a factor of failure. Yes, there’s a lot of expensive and branded running gear, the only benefit of it is the warranty that if could last longer. But that doesn’t matter, what you have now as your running gear is enough for you to start to run. Along the way you could choose and find the best that will fit to your budget and needs — promise to that! I started to get curious and wanted to try long running since 2009. You could say I’m the typical runner who got his fair share of running several 5Km, 12Km, 15Km, 21Km, 42Km distances held in Cebu hosted by fun run organizer. They may just be called fun runs but they had helped a lot in improving me as a runner, physically and mentally, and had contributed to discovering the DPD principle (Dedication, Patience, Determination). In 2011, I finally was able to experience my first official ultramarathon run, the 104.5Km “Cebu Century Challenge” from Bogo City plaza to Fort San Pedro, Cebu City. The said run was hosted by FrontRunner in cooperation with Century Properties, thanks to organizer headed by Sir Jonel Mendoza. With the help of family, friends, and DPD Principle, I finished the race in 16:42 hours. So now what? Doing these running challenges give back a lot to me by helping me, not only physically but also in shaping my attitude towards life. Running reminds me that to move forward in life, I only need to be dedicated, patient, and determined to overcome whatever challenges I encountered. Hope you enjoy running through this article and change the way how you acknowledge running in your life. For more stories about running and life and running and life, please LIKE our facebook.com/runroo, or connect with us at twitter.com/gorunroo. Good article to read on.